This year, JEC Group awards innovations in the following categories: aerospace (structural and tooling), automotive, commercial vehicles, e-mobility, marine, railway, sports & leisure, infrastructure & civil engineering, industrial equipment, sustainability and additive manufacturing. The ceremony will take place on Thursday November 15, 2018 at the COEX Center of Seoul (South Korea). 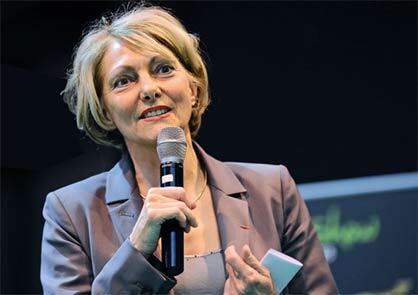 Ida DAUSSY (Seo Hye-na), will host the ceremony in front of officials, manufacturers, scientists and composites professionals. Most of the composite structures for aircraft are made of carbon-epoxy composites, which can withstand a maximum service temperature of 130°C. As a consequence, carbon-epoxy materials cannot be used in hot zones like engine vicinity areas. 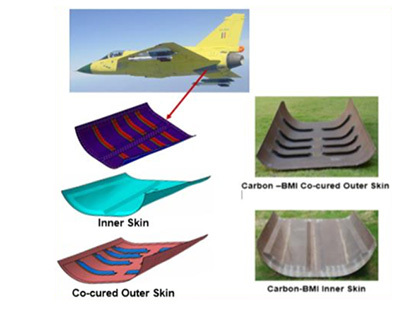 The Aeronautical Development Agency (ADA) and CSIR-NAL took up the challenge of developing high temperature resistant composites for use in hot zones of light combat aircraft, which would result in significant weight and cost savings, as well as a considerable reduction in the meantime between failures (MTBF) due to thermal ageing. The first task was to choose a material system with a service temperature of about ~ 200°C. During the material selection process, it was found that BMI resins are a relatively young class of thermosetting polymers. Hence, a carbon-BMI prepreg was selected due to a number of unique features including excellent physical property retention at elevated temperatures and in wet environments. It was realized that weight savings and performance can be maximized using co-curing technology. This results in a large reduction of fabrication cycle times, costs and weight. Co-cured structures have fewer fasteners, which results in shorter assembly cycle times and also reduces sealing issues. A prototype engine bay door assembly was built and tested at 180°C for flight certification. The engine bay door consists of an inner skin and co-cured outer skin assembly with eight transverse stiffeners. The stiffeners were designed with ‘J’ sections. The door size was 1.5 m length, 1 m width and 0.4 m overall depth. The co-cured door was developed using autoclave moulding. Two doors were installed in prototype aircraft and successfully flown. HyVarC® is a patent-pending hybrid InVar and carbon fibre composite layup mould. HyVarC® layup tooling offers a high-precision, lightweight, short lead time solution for prototype and development applications. HyVarC® combines a thin Invar backup structure and facesheet with a bonded, high-temperature carbon fibre composite working surface. The resulting tool is 50% lighter than a traditional Invar layup mould and has a 20% shorter lead-time compared to a traditional composite tooling solution. The tool’s unique manufacturing process eliminates the need for a master mould, typically required for composite tooling. The thin Invar backup structure and facesheet are part of the final product and serve as the interim master for the composite working surface. This saves the time and cost of creating a second backup structure of composite. HyVarC®’s thinner Invar structure requires less time to weld than the standard Invar thickness used for metallic tooling and eliminates the need for an annealing cycle. The machined composite working surface offers better dimensional accuracy than net-mould composite tooling, while the Invar facesheet provides vacuum integrity and durability. 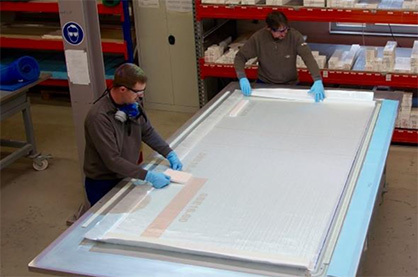 Although machining operations on composite surfaces will lead to micro-cracks over time in the high- temperature, oxidative environment of an autoclave, a part fabricated on a HyVarC® mould is bagged to the Invar facesheet. Vacuum reliability is not dependent on the composite surface and does not degrade with age or thermal cycling. Finally, the composite working surface is easily re-machined to support modifications for rapid prototyping. Additional composite layers can be added and machined to accommodate design changes and feature additions. More significant changes can be accomplished by burning off the composite working surface and starting anew, with no change to the Invar structure. For the first time in a serial-produced car, the stabilizers on the front and rear axles are made of carbon, as well as their coupling rods – all with outstanding performance. The weight reduction reaches more than 55% compared to the steel version. With the new high-speed hollow prepreg compression moulding process, the cycle time is less than 6 minutes, resulting in the opportunity to produce 220 parts per day and 70,000 parts per year. Leaf springs are mainly used in suspension systems for commercial vehicles and SUVs. They have to sustain various load conditions, such as longitudinal and lateral loads, brake torque, etc. This innovation can achieve almost 50% weight reduction and 5 times greater durability through the introduction of a tailored material, design optimization and innovative manufacturing processes. A new epoxy resin system combining fast curing and high toughness was designed for the thick composite sections (>100mm), offering excellent mechanical performance. In this development, the following technical challenges were solved regarding two environmental factors (temperature and hot-wet exposure): (a) enhancing the basic understanding of degradation behaviour, (b) assessing the environmental effects on material properties and (c) developing the design allowables, which are statistically-based material properties derived from test data. The durability-based material properties were then considered to set up the guidelines for the design and development of a composite leaf spring together with the environmental compensation factors. The compact design can save approximately 50% weight compared to a conventional multi-leaf spring. 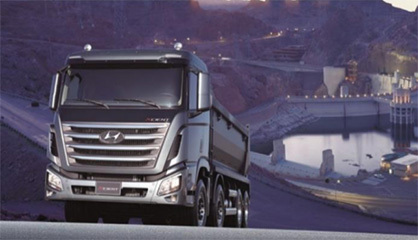 It also offers improved NVH (noise, vibration and harshness) behaviour and fatigue durability. To optimize the cure cycle and minimize distortion in the thick composite (>100mm), both cure kinetics and chemo-rheological model parameters were implemented in the software. This made it possible to predict and find adequate curing conditions. Damage tolerance is the attribute of a structure that can retain a required structural strength or stiffness after accidental or discrete damage. FE-based multi-scale and progressive failure analysis was used to predict the residual fatigue life and to assess the effect of a damage event on the performance of the composite leaf spring. 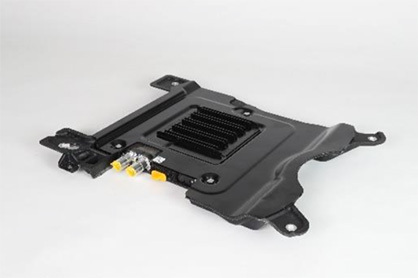 The most important component for vehicle integration of an inductive charging unit is the glass fibre-reinforced plastic (GFRP) holder, which must meet the demanding package requirements while ensuring the charging function and safety. The structural function is ensured by oriented glass fibre reinforcements and ribs formed during the compression moulding process that provide protection against mechanical stress. In addition, glass fibre-reinforced polypropylene has a very good crack stopping function, which can prevent subsequent severe damages after previous minor injuries of the surface. Due to simple processing by compression moulding, the inserts can be placed either in “one-shot” in the tool or during the downstream process afterwards. All the inserts and associated screws are selected considering corrosion protection and low electromagnetic interference requirements (e.g. materials such as stainless steel and aluminium). Inductive charging units are mounted below the integral support frame of the vehicle. This results in high demands on component protection, magnetic field control, cooling and assembly/service requirements. A novel holder system had to be developed for the integration of the vehicle coil. The highly efficient GFRP holder is made of a combination of compression-moulded glass fibre and glass mat-reinforced polypropylene that can be manufactured to net shape in a one-shot process that makes it completely automated. The holder is assembled together with a 1-mm-thick aluminium shielding plate with attached cooling fins. The connection is ensured by a soft adhesive layer, which also minimizes vibration and seals against penetration of corrosive substances. By using cost-effective materials such as glass fibre-reinforced polypropylene and aluminium sheet material in combination with low-complexity tools, attractive economical concepts are feasible for vehicle integration, even for small or medium volumes. The FABHELI collaborative project, funded by the French Defence Procurement Agency (DGA) and supported by Loiretech together with its partners Mecafrance and Naval Group, aimed to develop and produce, on an industrial scale, a propeller with a reduced environmental footprint and lower energy consumption (around 15% lower). The project started in April 2016 with a digitization and calculation phase conducted by Mecafrance for the mechanical part and Naval Group for the hydrodynamic part, in order to dimension the carbon fibre composite propeller (twice as light as its metallic counterpart). The goal was to meet highly demanding specifications. Indeed, the propeller undergoes significant mechanical constraints in use, so that it was necessary to develop innovative concepts, production technologies and surface treatments to support them. AML replaced the metal propeller on the ship with the composite propeller. 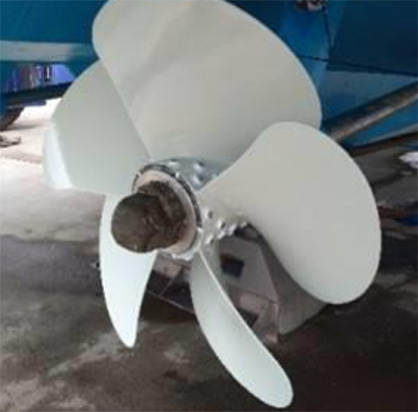 The sea trial conducted in March 2018 put a strain on this new propeller: many manoeuvres at the ship’s maximum power made it possible to validate the intrinsic qualities of the composite propeller with the support of the Bureau Veritas certification agency. At the end of this operation, the propeller had a very suitable appearance so that a continuation of the project is now considered to optimize the functional and manufacturing process and then engage in series production, which is the stated objective of Loiretech and Mecafrance. The ICE is the prestigious fastest train of the German railways fleet. The company presented the new Version 4 last year. There are over 66 Version of 3 trains still in use as the main passenger railway transportation system in Germany. This fleet was introduced in the year 2000 and its passengers wagons are now being renovated. In order to meet modern comfort standards, the interior will be upgraded including, for instance, the passengers entertainment and air conditioning systems. The additional weight for the new equipment had to be compensated by sophisticated lightweight solutions. With this development, a lightweight flooring system was created to keep the weight input at a minimum. Importantly, the novel system needs to comply with the EN 45545-2 fire safety regulations that are valid from 2018 on. The entire floor system, with an average panel size of 2400 x 1200 mm, will be renewed to replace heavy plywood with lightweight GFRP panels based on SAERTEX LEO® materials. This non-crimp fabric-based material system with integrated coating made it possible to manufacture all the sandwich panels in a vacuum infusion process using vinylester resin. Importantly, the production process incorporates reusable silicon membrane technologies from Alan Harper Composites. This technique was implemented and adjusted by SMT to allow an enhanced process with increased output, to gain higher reproducibility and quality value, but also to save material costs. This resulted in the competitive production of high-end composites with minimum material waste. The use of this composite material inside the ICE3’s new floor achieved the highest fire safety standards, 98% less flame progress, 57x less smoke generation and 12x higher tensile strength compared to the HLU lay-up solutions that were in competition. 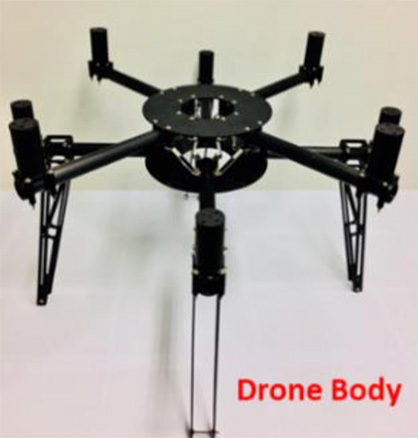 The existing CFRP (carbon fibre-reinforced plastic) drone was brittle at low temperatures and the many CFRP parts were damaged in the event of a collision, resulting in breakage. When bisphenol F epoxy resin with tetra-functional resin and GO (graphene oxide) was applied to the CFRP materials, mechanical properties such as impact strength, tensile strength, and fracture toughness were improved by over 20%. Bisphenol A epoxy resin exhibits higher mechanical properties than bisphenol F epoxy resin. The mechanical properties of bisphenol F epoxy resin were improved by over 20% using only 0.1 wt% GO (standard graphene (SG), GO-V50, Korea). The mechanical properties of high-concentration GO added CFRP decreased due to the high volume fraction of GO in the epoxy resin. The mechanical properties of 0.1 wt% GO added CFRP were improved and the optimized GO weight fraction was found for making nanocomposites with a high fracture toughness. 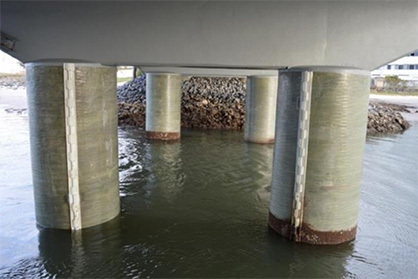 A three-year collaborative development project between Joinlox and USQ resulted in the development and commercialisation of a new type of composite pile repair system made of a prefabricated fibre-reinforced polymer (FRP) jacket with an innovative joining system for infrastructure rehabilitation. Compared to traditional composite repair systems, which are directly wrapped around the damaged structure and require a lot of site preparation, this technology is quick to install due to its easy-fit and self-locking mechanical joining system. The novel joining system comprises two rows of interlocking teeth that can easily fit into each other like a zipper, and a locking key to provide continuity of the composite repair system. The design of the innovative joint mimics the way a clam shell closes its hundreds of small filaments together – with precise ease and strength. The prefabricated jacket is manufactured from E-glass fibres and vinyl ester resin using the filament winding method, while the joint (teeth and locking key) is made of pultruded fibre-reinforced vinyl ester resin. This repair system works by wrapping the composite jacket around the damaged pile, aligning the interlocking teeth together, and placing the locking key vertically along the seam to lock the jacket providing the structural continuity. This simple assembly process can be carried out underwater or alternatively above waterline. The complete assembly is then lowered in the water up to the required depth, and the annulus between the jacket and the pile is filled with water-displacing grout producing a cylindrical confinement. Once installed, the jacket remains in place to protect and rehabilitate the pile and becomes an impermeable barrier to oxygen and water, stopping anything from getting into the pile. 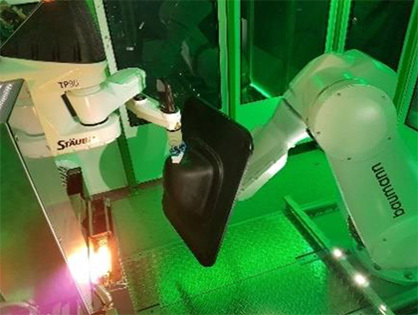 During the five past years, the partners developed a high- performance lightweight robot gripper and assembly system made of CFRP as a modular production system for flexible use in the automotive and aviation industries. Actually, the new system should replace today’s Euro-Greifer-Tooling/EGT system to save weight. The EGT system is an existing industrial standard widely used for industrial robot applications in the automotive industry. It consists of three types of load-carrying aluminium profiles and various metallic connecting elements. The new lightweight gripper system focuses on two lightweight levels. The so-called “Lightweight- Gripper-System-Level 1” consists of the conventional three EGT profiles made of aluminium in combination with carbon fibre-reinforced SMC elements including various connectors and two extremely high-loaded robot flange plates to achieve 15-25% weight reductions of the robot gripper depending on the arrangement of the total gripper. 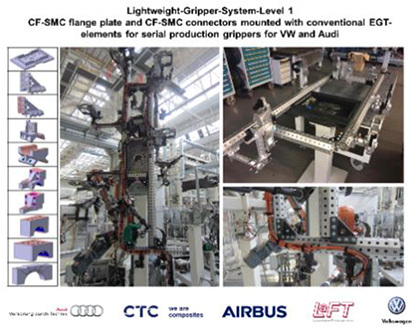 In contrast, the “Lightweight-Gripper-System- Level 2” is a completely new modular system that achieves 40-60% weight reductions depending on the gripper’s arrangement. 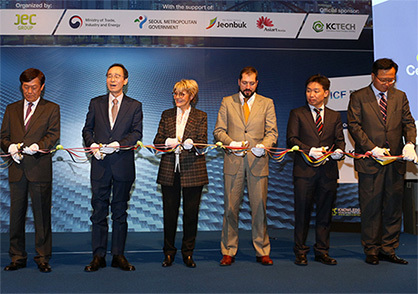 It is the first modular, high-performance and cost-efficient CFRP production system, which will be used as a future industrial standard in the automotive and aviation industries. It fulfils all the requirements of today’s EGT system related to mechanical performance, tolerances, flexibility, variability, robustness, adjustability and handling combined with up to 60% weight reduction, cost efficiency and higher stiffness. Hence, the second lightweight level consists of a complex pultruded CFRP “X-profile” with a multi-layer structure, a multi-oriented CFRP tube and various carbon fibre SMC connecting elements including robot flange plates with metallic inserts. All the system kit elements are based on vinyl ester resin to achieve a good compromise between lightweight performance, cost efficiency and processability. Automated fibre placement (AFP) processes produce a lot of uncured prepreg tape material scrap because all reels of tape are simultaneously changed as soon as the tape left on one reel is not enough to place the next layer of the laminate. With large AFP systems that process up to 32 reels in parallel, manufacturers suffer from high scrap rates of ~10%. Individual reels have up to 200 metres of material left when they are exchanged. This increases the overall cost significantly. This is the reason why Premium Aerotec teamed up with Cevotec to use their Fibre Patch Placement (FPP) technology to process “left-over” AFP tape. This effectively improves material utilization in the AFP process and reduces the overall cost, as >90% of the residual tape can be used for parts or repair patches for which new fibre material would be needed otherwise. In addition, the uncured prepreg material is otherwise disposed of at high cost. This innovation effectively “recycles” the left-over AFP tape. To enable this, Cevotec successfully adjusted their FPP system to work with 1⁄2 inch-wide thermoset prepreg tape. But the innovation does not stop here. Premium Aerotec had a specific part in mind to be built with FPP: a pressure cap with a complex, double-curved shape and a circumferential flange for rivets – so complex that regular fabrics cannot be draped to achieve the desired geometry. In the past, Premium Aerotec examined different materials and processes to build this pressure cap, all of which resulted in high cost and a heavy part. Cevotec was able to design and manufacture the part with their FPP technology, using residual AFP tape provided by Premium Aerotec. The part’s recurring costs were reduced by 75% and the weight by 70%. The cost reduction considers the full price of the AFP material – considering that the material would have been scrapped and therefore should have a cost of zero, the cost reduction is even greater, equalling 88%. Over the last three years, additive manufacturing (AM) of metals and polymers has been growing at an impressive 33% CAGR. AM enables the manufacture of very complex shapes and helps achieve lightweight designs and functional integration thanks to the combined benefits of optimal topology, function integration and the use of optimal materials. Prediction of the short- and long-term behaviour of the printed part. To help the AM industry transition from prototyping to actual manufacturing of plastic and composite parts, the material modelling company e-Xstream set-up an ecosystem of relevant partners. A group of material suppliers (including Solvay Engineering Plastics and Solvay Specialty Polymers), printer OEMs (including Stratasys), end-users (auto and aero) and R&D institutes are joining forces to offer the industry a holistic modelling solution for additive manufacturing. Materials: e-Xstream is extending its material engineering tools (Digimat-MF & Digimat-FE) to engineer advanced composite materials specifically for additive manufacturing. Material models can then be promoted and exchanged via the material exchange platform Digimat-MX. Process: e-Xstream is developing a new software solution, Digimat-AM, 100% dedicated to process modelling of FDM and SLS for reinforced materials. 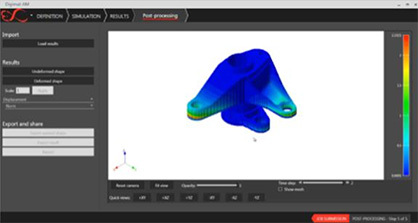 Part performance: e-Xstream is extending its Digimat structural analysis solution to enable product designers to simulate the printed part performance (stiffness, strength,...) as a function of the material and printing process parameters such as tool or sintering laser path.